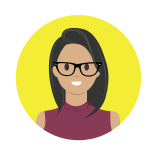 Looking to invest in real estate in Abu Dhabi? Following our release of the Q3 2018 reports for Dubai and Sharjah, its now time to take a look at the price trends in the Abu Dhabi property market. Let’s take a look at how the capital city has fared from a rental and investment perspective for properties in Abu Dhabi for Q3 of 2018. 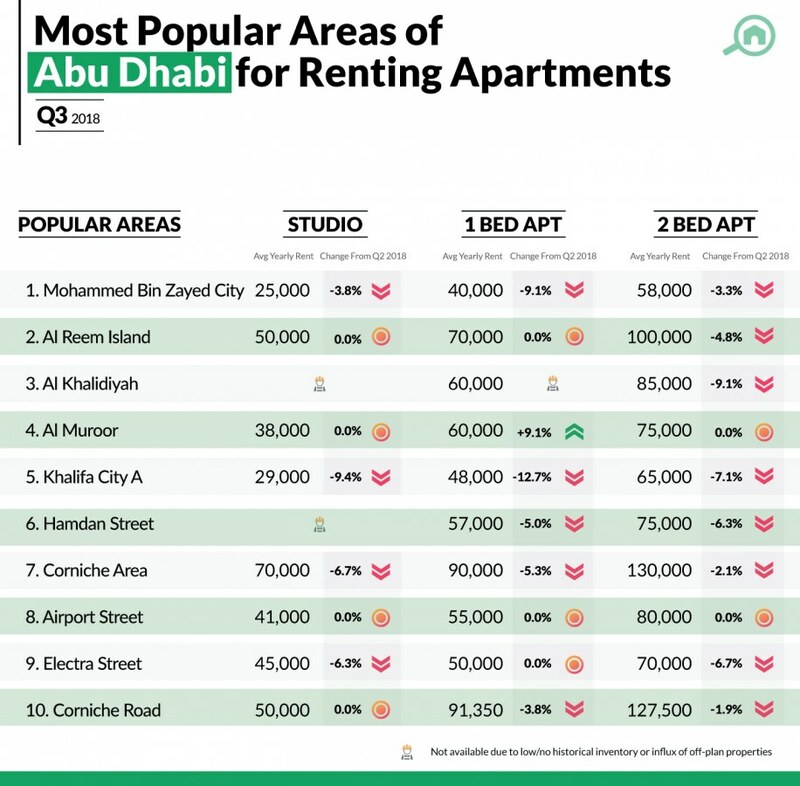 Top 10 areas to rent apartments in Abu Dhabi. 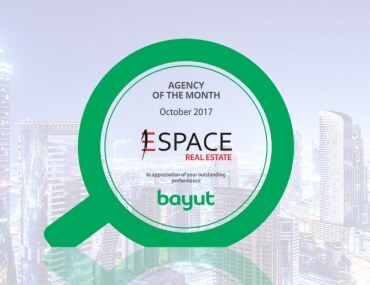 On evaluating the real estate trends in Abu Dhabi for Q3 based on the data from Bayut.com users, the top ten areas to rent flats in the Abu Dhabi property market are more or less similar to what we saw in the H1 Abu Dhabi market report for 2018, with the most significant drops being for 1-bedroom apartments in Khalifa City A where average prices fell by 12.7% from AED 55k to AED 48k, followed by a 9.4% decrease for studios from AED 32k to AED 29k. The quite and wholesome neighbourhood of MBZ City was the most popular area to rent apartments in Abu Dhabi, where the prices are now AED 25k for studios, AED 40k for 1-beds and AED 58k for 2-beds. The 1-bedroom apartments in Mohammed Bin Zayed City are the only units which saw a significant decrease of 9.09% where the prices fell to AED 40k. The waterfront apartments for rent in Al Reem Island are the second most popular for renting flats in Abu Dhabi. The prices here remained the same for studios averaging at AED 50k and 1-bedrooms are at AED 70k. The only noticeable change was for the 2-bedroom apartments where the prices have gone down to AED 100k. The third most popular area for renting apartments in the Abu Dhabi real estate market is Al Khalidiyah, which feature some beautiful waterfront views. The flats here only saw a noticeable change for the prices of 2-bedroom apartments which are now AED 85k. The prices for 1-bedroom flats for rent in Al Khalidiya average at AED 60k. Other notable areas to rent apartments in Abu Dhabi include Al Muroor, Khalifa City A, Hamdan Street Corniche Area, Airport Street, Electra Street and Corniche Road. Amongst these, the only substantial change was a 9.09% increase for 1-bedroom flats in Al Muroor, while the rest saw a decrease of 0-6%. For apartment sales in the Abu Dhabi property market, the decreases were modest overall. The only noticeable change in the flats for sale in Abu Dhabi was an 8.62% decrease for studios in Al Reem Island where the prices went from AED 635k to AED 580k and an 8.24% decrease for 1-bedroom apartments in Saadiyat Island. Known for its spacious and reasonably priced flats, Al Reem Island is the most popular area to buy flats in Abu Dhabi. The prices for the apartments here fell across the board with prices for studios, 1, and 2-beds going for AED 580k, AED 950k and AED 1.5M respectively. 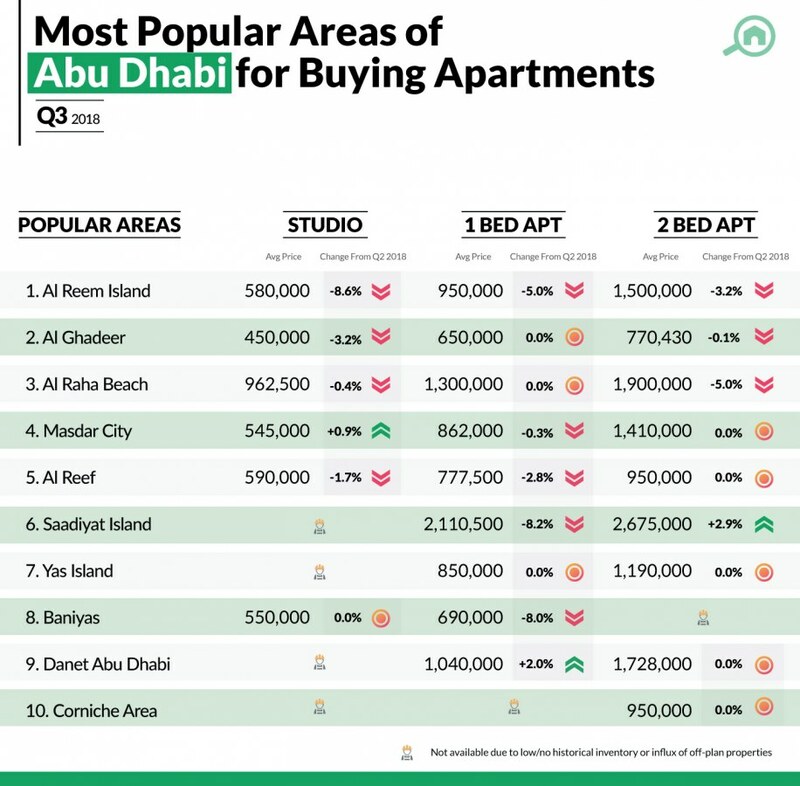 Coming in a close second are the apartments for sale in Al Ghadeer which is the most wallet-friendly area to buy apartments in the Abu Dhabi real estate market. Here, the only noticeable change was for studios at AED 450k, while prices for 1 and 2-bedroom flats have remained stable at AED 650k and AED 771k respectively. Al Raha Beach took the third spot with studios averaging at AED 963k, 1-bedroom units go for AED 1.3M and 1-bedroom apartments are at AED 906k. The 2-bedroom apartments for sale in Al Raha Beach saw a decrease to AED 1.9M making it the ideal place for investors looking to buy apartments in the Abu Dhabi property market. Other notable areas to find great apartments for sale in Abu Dhabi include Masdar City, Al Reef, Saadiyat Island, Yas Island, Baniyas, Danet Abu Dhabi and Corniche Area where prices for 2-BHK flats in Saadiyat and Baniyas saw a decrease at the 8% mark. 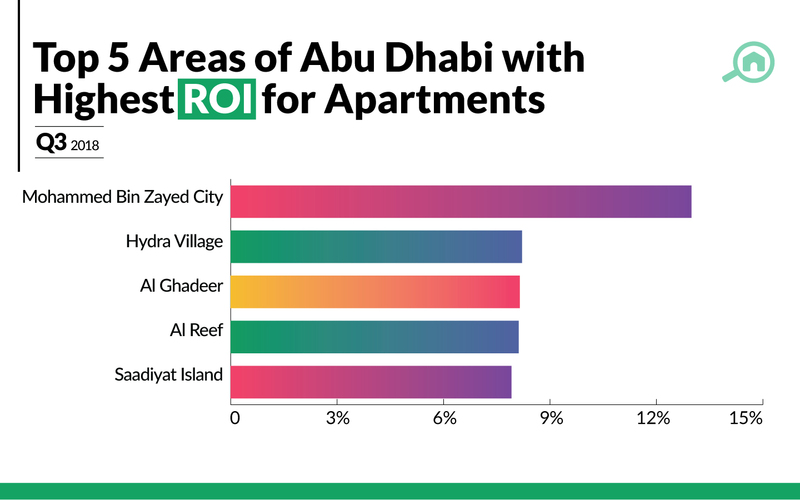 Areas offering the highest ROI for those looking to invest in Abu Dhabi apartments. Investors planning to buy apartments in Abu Dhabi for renting it out to receive a high return on investment (ROI), should look at areas such as Mohammed Bin Zayed City, Hydra Village, Al Ghadeer, Al Reef and Saadiyat Island. To receive the maximum ROI for flats in Abu Dhabi this quarter, investors should consider the apartments in Mohammed Bin Zayed City as its rental yield is at a whopping 13%. 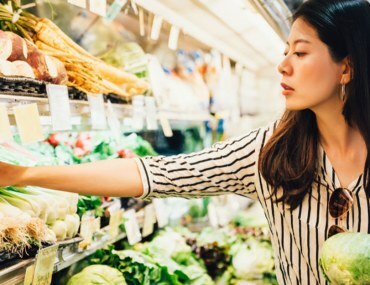 This is followed by Hydra Village, Al Ghadeer, Al Reef and also the apartments for sale in Saadiyat Island, all of which garner a rental yield around the 8% mark. Top areas for renting villas in Abu Dhabi. Villa rentals in the Abu Dhabi property market saw a decrease in prices across the board, however, the steepest price falls were for 5-bedroom villas for rent in Al Karamah where they fell by 14.29% from AED 210k to AED 180k, followed by 3-bedroom villas in Mohammed Bin Zayed City with a 13.64% decrease where prices fell to AED 95k from AED 110k. The villas in Khalifa City A ranked as the number one area to rent houses in the Abu Dhabi real estate market which is surprising to note as this area saw an increase in rental prices across the board, with the 1-bedroom units seeing a substantial increase of 15.4% to AED 150k. The rental prices for the other units are now AED 150k for 3-bedrooms and AED 170k for 4-bedrooms. The second spot for the most popular area to rent villas in Abu Dhabi went to the up and coming MBZ city where prices are now AED 95k for 3-bedroom villas and AED 145k for 5-bedroom villas. The third spot was taken by the villas for rent in Al Reef. 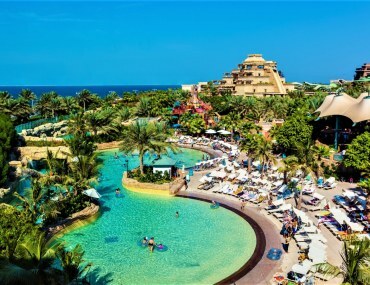 The prices here saw a decrease for all its units and on an average the prices are now AED 115k, AED 145k and AED 158k for 3, 4 and 5-bed villas respectively. Areas such as Al Mushrif, Khalifa City B, Al Karamah, Hydra Village, Al Muroor, Al Khalidiyah and Al Raha Gardens also made it to the list of popular areas to rent villas in the real estate market in Abu Dhabi. The notable price changes in these areas is an increase of 10.71% for 5-bedroom villas in Khalifa City; a 5.9% increase for 3-BHK units in Al Muroor; and a decrease of 10% for 3-bedroom villas in Al Karamah. Top areas to buy villas in the property market in Abu Dhabi. Villa sale prices in the Abu Dhabi real estate market have remained more or less stable, with changes staying between 0-5%. The most significant difference was seen for 5-bed villas in Saadiyat Island, where the prices fell by 4.35% from AED 9.2M to AED 8.8M. Al Reef retains the coveted position as the most popular area to buy villas in Abu Dhabi with prices for studios, 1, and 2-beds going for AED 580k, AED 950k and AED 1.5M respectively. Coming in at second place are the upscale villas in Saadiyat Island which are incidentally also the most expensive area to buy villas in the real estate market in Abu Dhabi. Only the 4 and 5-bedroom houses saw a price change, while prices for a 3-bed villa here remained the same. The prices for these units now average at AED 5.5M for 3-bedrooms, AED 7.8M for 4-bedrooms and AED 8.8M for 5-bedroom villas. 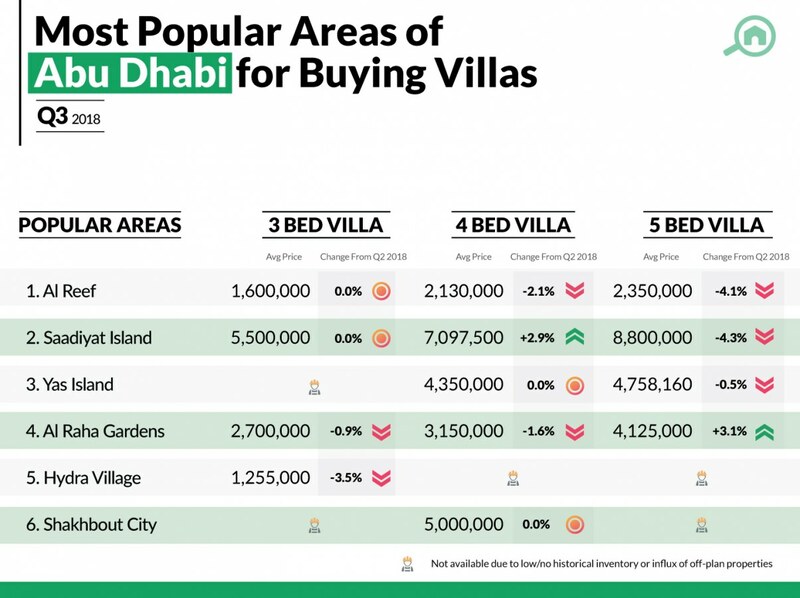 Yas Island, Al Raha Gardens, Hydra Village and Shakboot City also made it to the list of popular areas to buy houses in Abu Dhabi with the most noticeable change being a 3.1% price increase for 5-bedroom villas in Al Raha Gardens. Areas offering the highest ROI for those looking at investing in villas in the property market in Abu Dhabi. Investors looking at buying villas in Abu Dhabi for the purpose of renting should consider areas such as Shakhbout City, Al Shamkha, Hydra Village, Al Reef, and Al Salam Street. 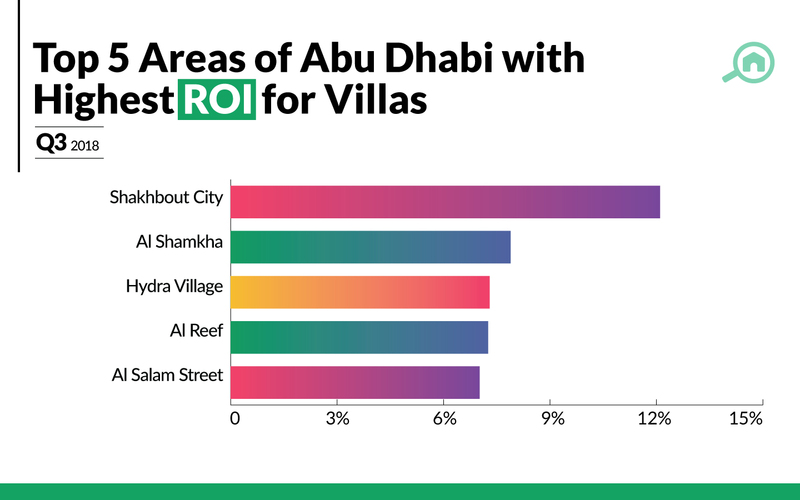 Amongst these areas, investors will receive the highest ROI in the villas for sale in Shakhbout City where the rental yield of 12.1%, in this quarter. As for investing in the other areas with villas in the Abu Dhabi real estate market, investors can expect a rental yield within the 7-8% mark. Top off-plan projects in the Abu Dhabi Abu Dhabi Property Market. The renewed interest in investing in off-plan properties in Abu Dhabi has resulted in several high-profile projects being announced by reputed builders. For investors looking to invest in the Abu Dhabi real estate market’s off-plan developments, the popular areas are Yas Island, Saadiyat Island, Al Reem Island, Al Raha Beach and Al Samha. Within Yas Island, the Ansam project was the most searched for at 39% and in Saadiyat Island, the top spot went to Jawaher Saadiyat which also accounted for 39% of the searches. Shams Abu Dhabi took the lion’s share with 93.64% of searches by Bayuts users. The Abu Dhabi property market in Q3 has seen prices fall on average for both apartments and villas with significant changes in property prices for a few areas in the emirate from Q2, 2018. Why plan a Vacation when you can Staycation? !